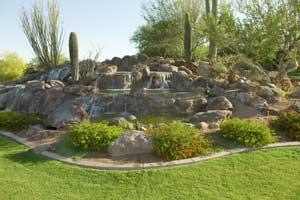 Want the best landscaping contractor in Scottsdale? Landscaping is a business where everyone from a kid with hedge clippers to a well-organized team of seasoned professionals all do the same services. So how do you know which landscaping company is right for you? With over 25 years of hands-on experience as a landscaping contractor in Scottsdale, give Desert Environments a chance. We have the right combination of knowledge and experience to give you a perfect, thriving desert oasis. Our process makes sure to combine our expertise with your needs to create exactly what you're looking for. Our designers blend together what the local landscape has to offer with your desired outcome and come up with a design you're sure to love. We begin our unique approach by thoroughly inspecting the site and its local environment. Then we discuss your ideas of what you want your landscape to become. From there one of our seasoned designers takes your input and combines it with the details and intricacies of your property to create a custom landscape design. This three-step approach to creating a design makes you an integral part of the planning. We lend an attentive ear to fully get the scope and scale of your dream space. Our inspection of the area and surrounding environment allows us to discuss realistic options with you. It also helps us create an optimal blending of the natural surroundings with the design you want to incorporate. The final step, the landscape design, is an ongoing discussion. We want you to feel part of the process and thrilled with the end result. Our landscaping company does hardscaping too! We'll check for your satisfaction! Each one of or jobs includes a follow-up inspection and is backed by our warranty! Let us help you make your property look great! We love the feeling of seeing an envisioned landscape design come to life. We'll even come by for a free consultation so you can see our dedication to our work firsthand. And with no obligation, there's no reason not to let us stop by! 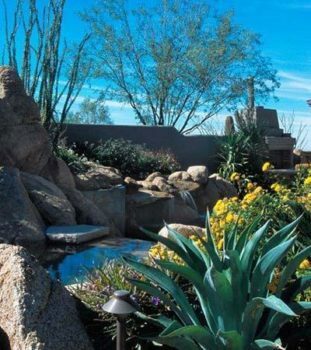 So give our landscape contractors in Scottsdale a call to see how they can help you today!